Today we visited the Padangtegal Mandala Wisata Wanara Wana Sacred Monkey Forest Sanctuary. 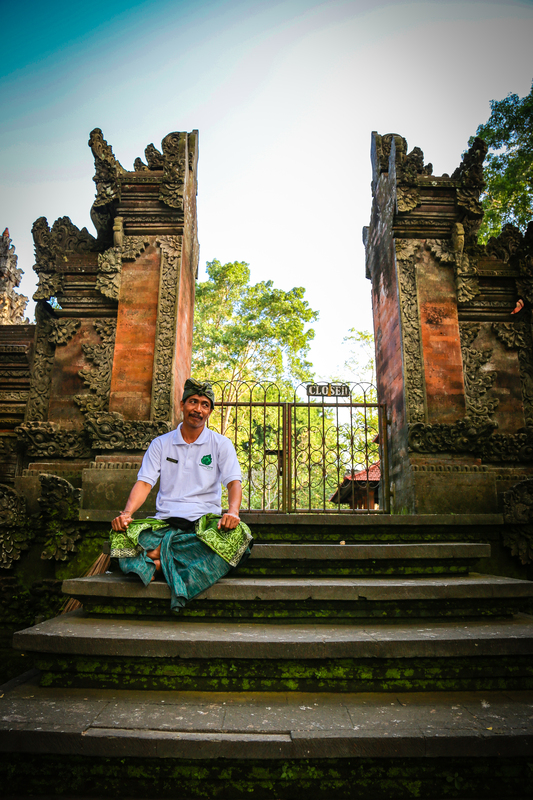 To say that the Ubud Monkey Forest is a popular tourist attraction would be an understatement. This was our first visit to Ubud and to be honest I am glad we are not staying there. Tourists may come to eat, pray and love but the reality now looks a lot more like eat, shop and take selfies! After a wonderful day of batik creation and learning we ‘hopped by’ the Monkey Forest. The Monkey Forest lies within the village of Padangtegal, which owns it. The village’s residents view the Monkey Forest as an important spiritual, economic, educational, and conservation center for the village. We were told to expect something that resembled scenes from an Indiana Jones film, the Monkey Forest did not disappoint. We did not stay long but I focused on getting some photographs of the Pura Beji (also known as the Spring Temple) and the Pura Dalem Agung Padangtegal (also known as the Main Temple). 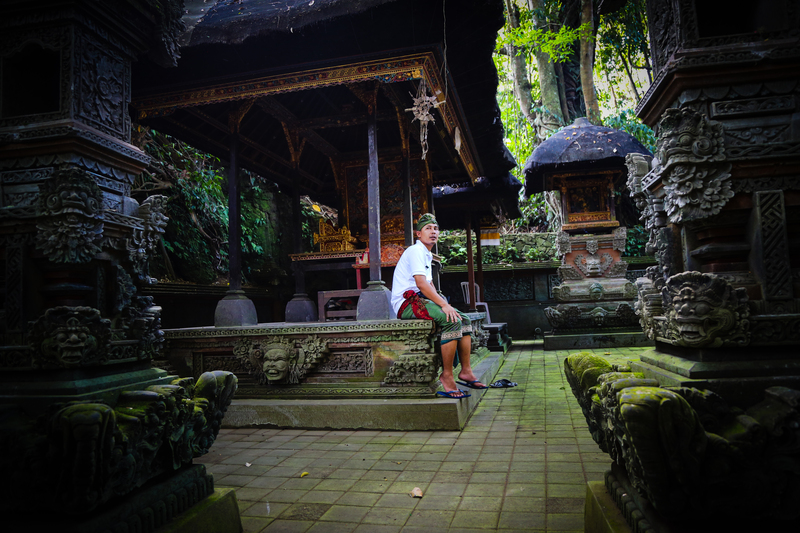 Young priest sits in the Pura Beji temple as the light seeks a pathway through the trees hanging overhead. 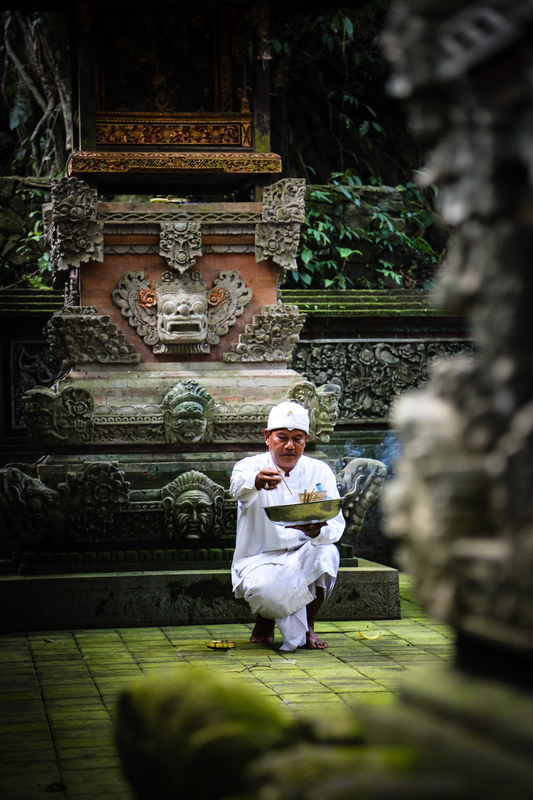 Priest preparing the Pura Beji Temple within the Monkey Forest in Ubud. Portrait of a priest in the Pura Beji. A Sacred Forest worker takes a short rest outside the Main Temple in the Monkey Forest. Monkey Forest; Ubud; Bali; things to do in Bali; tourism Bali; travel photography Bali. What a brilliant set of images Laura. The aperture is well chosen as it really focuses on the subject. My favourite is the one of the Priest (preparing the temple) as he looks so thoughtful yet proud of what he is doing and the framing from the wall has been positioned perfectly. Great work. Thanks for lovely comments! I loved the fact that outside the temple walls there were just so many tourists buzzing about and yet inside the walls is this peaceful calm. Thanks for stopping by. Will check it out Matt – thanks for the kind words! I especially like the first image with the focus of the light and color around the priest. It’s those magical moments that make me want to continue learning photography – never stop learning!